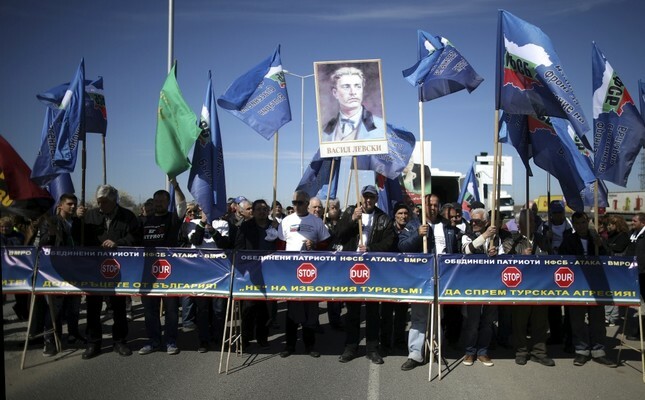 Supporters of Bulgarian nationalist parties blocked the border crossing to prevent ethnic Turkish citizens carrying Bulgarian passports from voting in the Sunday parliamentary elections. Bulgaria closed down the Kapitan Andreevo Border Gate with Turkey, located across from the Kapıkule Border Gate, on Friday amid protests by far-right nationalist extremists against migrants and Turkey, blocking the vehicles attempting to cross the border to Bulgaria from the Turkish side. The far-right group, United Patriots, consisted of nearly 50 people carrying placards with anti-Turkey slogans, closing off the road used by cars crossing the border in an attempt to stop dual Turkish-Bulgarian citizens from voting at the elections in the country on Sunday. Nearly 50,000 voters expected to travel from Turkey to vote. During the protests, Bulgarian security forces only allowed diplomatic vehicles and some private cars, while blocking journalists and buses. The wave of far-right extremism has been rising steadily across European countries, particularly against migrants, Turks and Muslims. However, despite attempts by Bulgarian far-right groups to block Turkish-Bulgarians along the border during the week, many people have made their way to Bulgaria to cast their votes in the March 26 general elections. Bilal Kılıç, a representative for the Democrats for Responsibility, Freedom and Tolerance Party (DOST), said what happened at the border earlier in the week was a provocation. "It was definitely wrong according to international law. Our voters are determined to cast their votes," he said on Thursday. Also, the Bulgarian government's attempt to limit the political rights of the country's minorities has recently been criticized by Turkey.Meanwhile President Recep Tayyip Erdoğan criticized what he described as "pressure" on ethnic Turks in Bulgaria ahead of the elections in the country. In spite of the threat of the far-right and limitations by the Bulgarian government, Turkish-Bulgarians will vote in the elections. Bulgaria has a sizable Turkish minority, in addition to the Pomak [Muslim Bulgarian], Macedonian, Greek and Roma groups. The political parties "Movement for Rights and Freedoms," and "Democrats for Responsibility, Freedom and Tolerance," which were established by Turkish minorities in Bulgaria, will also participate in the general elections, a fact that has disturbed some ethnic Bulgarian political parties afraid of losing voters. There are 588,318 Bulgarians of Turkish descent in the country, making them the country's largest ethnic minority with 8.8 percent of the population.